Iridology is the science and study of pathological and functional disturbances in the human body as indicated by abnormal markings and color changes in the iris of the eye, while revealing inflammation, where it is located and in what stage it is manifesting. The iris reveals bodily conditions as it relates to inherent (or karmic) weaknesses, levels of health, and the transition that takes place in a person’s body when they choose to purify the way they, think, live and eat. Figure 2: Examples of markings: white cloudy like spots around iris, also note markings in Figure 1 – circular lines that resemble rings in a tree, and straight lines that look like bicycle spokes. Figures 3&4: Examples of fiber structure: Figure 3 – loose structure, figure 4 – tighter fiber structure. Iridology – The study of the iris of the eye to determine tissue weakness and the body’s predisposition to weakness. 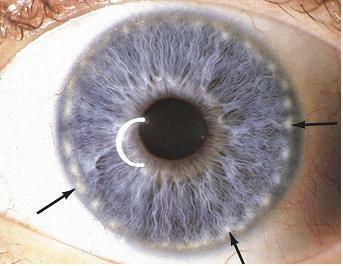 The Iridologist, when looking at the iris of the eye, is looking for variations in structure, coloration, and markings. These different markings can indicate stresses and weaknesses in the body systems that can manifest as imbalances, physically, mentally, and emotionally. You cannot see disease by looking into the iris, neither can diseases be named by iris analysis; what you can see is tissue deterioration and imbalances via the nervous system. This is because the iris of the eye is connected to every other part of the body through the nervous system and brain through embryonic mesoderm and neuroectoderm tissues. When studying the iris of the eye, an Iridologist is able to recognize toxins and their locations. These toxins create a breeding ground for bacteria, viruses, and parasites. Recognition of the location of these toxins can be helpful as the recipient of the Iridology reading then has an opportunity to make dietary, lifestyle, and behavioral changes, in direct response to the specific area of toxicity. For example: a toxic discoloration of cloudy yellow, in the 11:00 to 1:00 area of the iris can be an indication of mucus buildup in the head area with symptoms, related to, but not always, to sinus congestion and allergies. In most cases, this is often related to a previous or ongoing inadequate diet that includes dairy products, refined white flour, and white sugar. This particular example of discoloration can also indicate (in some cases), the toxicity involved which may be the bio-chemical/nutritional basis of mental and/or sense challenges such as; memory lapses, speech impediments, depression, hearing or sight difficulties, or even ADD. Iridology is a preventative tool, it can be used an early warning system, and eventually as a gauge for healing and signs of health. The goal of an Iridologist is to help people recognize areas of unconsciousness that manifest as toxic accumulation, and tissue and organ deterioration. Iridology provides a simple, unobtrusive means of looking into the body. With the information provided, clients are given an opportunity to begin making more conscious decisions regarding lifestyle and eating habits. Disease, germs, viruses’ etc., cannot sustain themselves in a clean pure body. These organisms need toxic bodies with lowered vibrational rates to live in. Iridology provides the visual means to identify weakened and stressed areas of the body where viruses and bacteria have a tendency to dwell and a way monitor healing.